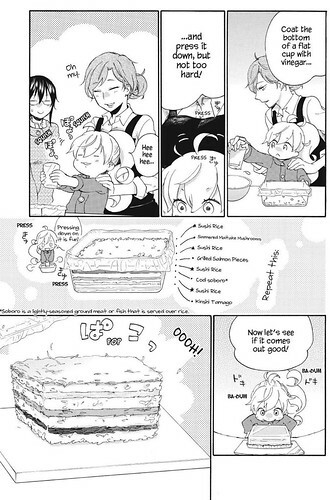 This cake comes from my current favourite manga/anime series, Sweetness and Lightning (Amaama Inazuma) by Amagakure Gido. It’s such a lovely series with recipes that are so simple to cook. The simplest of which was this amazing sushi cake. Yes! A sushi cake! It’s even simpler than okonomiyaki! Or even pancakes! As a person who leans towards savory things, there’s no easier savory cake than this! The easiest sushi and cake your might ever make. Mix the A-ingredients together in a bowl and set them aside. For the shredded omelette, mix B ingredients in a bowl and pour some of the mixture in a well-oiled/non-stick fry pan to make a thin crepe or pancake. Make as much egg pancakes that you can make and slice it thinly. For the sesame mushroom, in hot fry pan, fry all the B-ingredients together until everything's cooked. For the sesame mushroom, stir-fry all the ingredients together in a fry pan. Easy Peasy! As for the fish mayo, just mix everything in a bowl! Don't be tempted to add too much mayo! It's just there to help bring things together. The easiest way to cook the spinach namul is to places the spinach leaves in a bowl filled with boiling water. Mix it around until it wilts, drain, and immediately rinse with cold water. Afterwards, mix it with all the other ingredients. To build the sushi cake, place clingwrap in a tupperware, preferably a square plastic with no grooves. Afterwards, place the egg at the bottom as a thin layer. Then add rice. Then the spinach. Then the rice. Then the fish. Then the spinach, and lastly, another rice. Make sure to press down all the ingredients well so that they stick together. Wrap the sushi cake with the remaining cling film and let it cool and set for 10 to 15 minutes. When you're ready, flip the cake on a plate and serve! This dish was so fun and easy to do. If you have a rice cooker, you’d barely break a sweat with cooking the rice. If you’re feeling lazy, you can possibly buy cooked rice or microwaveable Japanese or Jasmine rice. What’s important is you press down the layers evenly. In fact, they have an awesome tip for that from Sweetness and Lightning — use the bottom of a flat glass! From Sweetness and Lightning ch. 23! Read this from Crunchyroll Manga! To be honest, you don’t have to do it with the ingredients I mentioned. 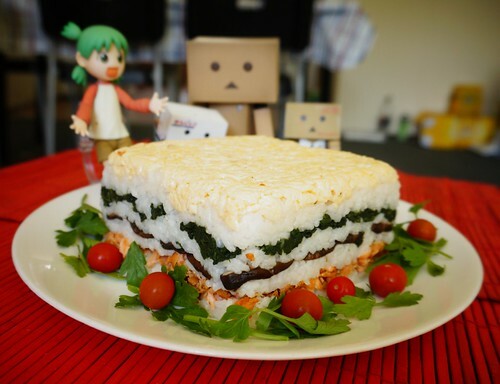 Think of it as your okonomi rice cake, choose whatever ingredient you want to put in it. You can add your own ingredients, like classic sushi ingredients like cucumber or avocado. Maybe make a taco rice sushi cake. What I won’t suggest is using actual fresh fish since that might easily spoil the cake. Any cooked ingredient will do. In fact, I wouldn’t mind having this with bacon bits. What I will suggest is to not use bulky/tough ingredients. As you cut your cake, you don’t want the fillings to fall apart so just make sure the fillings are easy to cut and can manage to hold its own shape. My choice of ingredients. 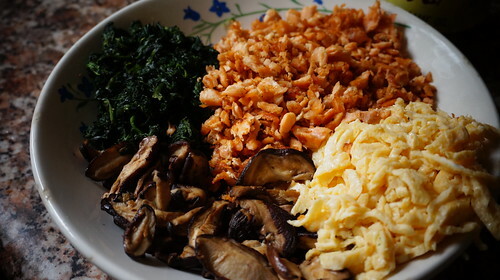 From salmon flakes (upper right), shredded omelette (lower right), mushrooms (lower left), and spinach namul (upper left). I love this dish! There’s something almost indulgent about sushi cake but it’s a lovely break from the usual sushi and onigiri. I am so happy to have crossed this in Sweetness and Lightning and I am more than happy to share this with all of you. Eating all the things in the last 10 years! 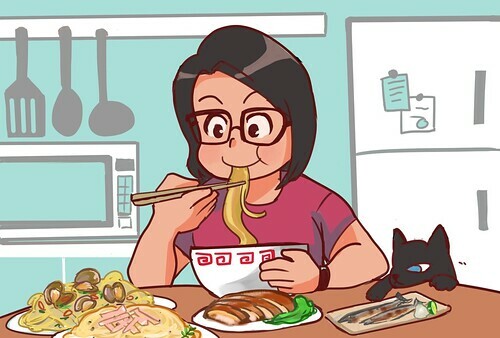 Super thanks to my lovely sister imo for this illustration!! To be honest, how I wish I can share this dish with all of you in person. As friends can attest, I love cooking for people and as long as I have access to a kitchen or an open flame, I’m more than happy to cook all kinds of meals for you. At best, this is the best place where I can share with you the awesome food I’ve eaten. So, even if I’m an ocean or a pokestop away, I am so grateful that you joined me in this blog for the last ten years! I hope you’ll continue to join me in my silly gourmand life. I have no idea where I’ll be but here’s hoping we’ll have fun in the next ten years!